For decades, the stethoscope has been a standard part of any health examination, but as of early spring there is a new way to assess how a patient is doing. Introducing the handheld ultrasound. While the handheld ultrasound is not a new piece of equipment, its many uses are fast making it one of the best investments for those in the medical profession. Unlike the more traditional full-size ultrasound system which can weigh as much as 400 pounds, the handheld ultrasound is lightweight (5 pounds or less), is easily transportable and can be used in a long list of scenarios inside and outside of the office. 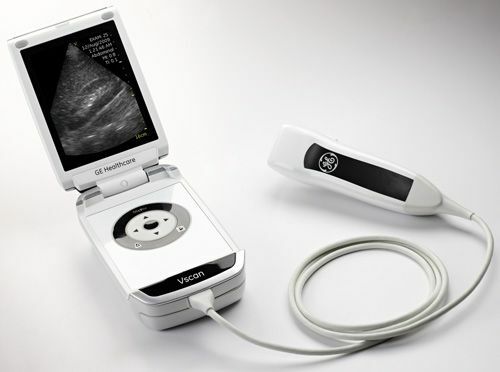 Better yet, unlike in many situations where a tool is made in smaller size but at the loss or restrictions of features in order to be fit the compact model, a handheld ultrasound does not significantly sacrifice any features – there are some small modifications, but the overall integrity of the ultrasound is not affected. So, how is the handheld ultrasound making a difference? Here are but a few examples. The military is now using them in the field to assess injuries. In many cases – especially on the battlefield – the injured soldier is unable to tell the medic what hurts or to what extent the pain exists. The handheld ultrasound is especially useful in identifying any internal bleeding within the chest or abdomen. This was formally quite difficult to assess without an inside look. It is equally beneficial in injuries where the injured person is conscious as in nearly 50% of situations where the injured soldier can tell the doctor where there is pain, they are incorrect. The handheld ultrasound avoids this error, allowing the treatment and healing process to begin more quickly. As of this week (August 2018) first responders in Foxborough, Massachusetts started the training for using the handheld ultrasound in the field. This will be a huge help, because it allows them to determine everything from a collapsed lung to internal bleeding or joint damage, and thus determine what treatment and whether the injury should be treated at a nearby facility or if they need be routed to a healthcare center a bit further out. The plan is to have the handheld ultrasound in use by September. The use of the full-size ultrasound in the office is a common occurrence, but a number of doctors are finding that the ultrasound is more effective than the stethoscope. In fact, Masood Ahmad, M.D., professor of internal medicine and director of the Cardiac Echocardiography Laboratory at The University of Texas Medical Branch at Galveston, has found that the handheld ultrasound is more efficient at gathering information about one’s heart. While a stethoscope allows doctors hear a patient’s heartbeat, the handheld ultrasound allows them to “see the heartbeat” and effectively and easily determine the cause of the problem. These are but a few examples of how the handheld ultrasound can make practicing medicine better. As providers of ultrasound equipment, the National Ultrasound team is always happy to learn how ultrasounds make a difference. If you have any questions about implementing or upgrading the ultrasound devices in your office, please don’t hesitate to contact us. We look forward to hearing from you! This entry was posted in News, Uncategorized and tagged handheld ultrasound, medical advancements, Ultrasound.